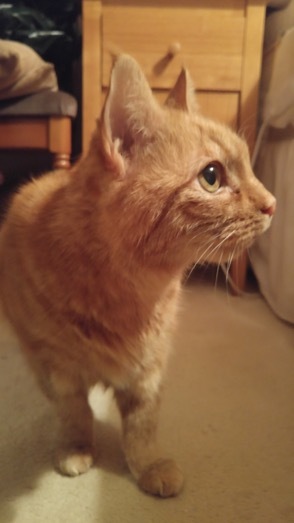 Eighteen-year-old Chester is one very fortunate cat. All too often, cats who are more mature in years can be overlooked and spend their final years in care. Not so for Chester. "Chester is continuing to do really well,' his owners told us. "He is such a lazy boy, bless him. He sleeps most of the day. "He and Jessie, our Spaniel are getting on fine. They just ignore each other most of the time! "He is now going out in the garden through the catflap but doesn’t like going out in the rain. But then, who does? "His purr continues to amaze us. it’s the loudest, squeakiest purr we’ve ever heard. He sounds like a train!" His new owners are worth their weight in gold. They saw his potential for giving plenty of love in return for a warm home and caring family. 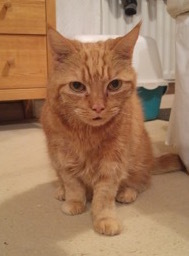 You can see that Chester will be eternally grateful that this family were prepared to give an older cat the happiness of a new home and lots of love. Don’t we all deserve that? If you think you could give a home to a mature cat, please get in touch or visit us at the National Cat Adoption Centre.